I was spreading peanut butter on my bagel the other morning in the Korean deli where I sometimes pick up breakfast when all of a sudden this large woman began hollering. Her hands were waving all around and I thought for a moment she was having a seizure until I realized she was merely experiencing a fervent reaction to the way I was dressing my bagel. Is it that out of the ordinary to mix peanut butter and cream cheese? I ask because everyone in the deli was staring at me, not her. With such a rapt audience, I calmly picked up the stainless steel spreader and slathered even more peanut butter onto my sesame seed bagel. I piled it so damn high it looked like a double decker hamburger. The white Styrofoam container could barely close around the bulging bagel. People averted their eyes. Americans are passionate about their peanut butter. We eat about 700 million pounds per year, enough to make ten billion peanut butter and jelly sandwiches, according to the National Peanut Board in Atlanta, Georgia. We’re also particular about our peanut butter. More than sixty percent of Americans prefer creamy style. Most men, though, opt for chunky. That’s how former President Jimmy Carter likes his nut butter. And while there are devotees of the big three – Skippy, Jif, and Peter Pan – more and more are opting for natural and artisanal peanut butters, which, ironically, is how the stuff was originally produced until the advent of hydrogenation in the 1920s. Hydrogenation is the technical term for the process that prevents the separation of oils and solids. This means peanut butter doesn’t need to be refrigerated and can have a longer, more commercially viable shelf life. That invention plus the use of peanut butter as a meat alternative for American troops during World War II led to a post-war peanut butter boom and the birth of a pop culture culinary phenom. Southerners seem to have a special predilection for peanut butter, perhaps because that’s where peanuts are grown. Southerners use it on anything from fried chicken to coleslaw to popcorn and cornbread. Bill Clinton proclaimed his love for the peanut butter and banana sandwich, a delight made famous by Elvis Presley. George W. Bush liked a peanut butter and honey sandwich. Today, bacon, figs, and peaches are popular accompaniments to peanut butter sandwiches in some nouveau Southern restaurants. Peanuts and peanut butter are even showing up in cocktails. In fact, I read recently in Garden & Gun Magazine about a gastropub called Ollie Irene in Birmingham, Alabama, that’s tarting up that Southern classic bourbon and coke by adding a peanut orgeaut. A gastropub in Alabama? Peanut orgeat? This I had to try. Peanut orgeat is a highfalutin name for simple syrup made with peanuts and orange flower water. To make it you start by shelling two cups of roasted unsalted peanuts and then pulverizing them in a food processor. On the stove, combine 1.5 cups of sugar and 1.25 cups of water and simmer until the sugar dissolves. Then boil for three minutes. Add the peanuts, reduce the heat and slowly bring back up to a boil. Remove from heat, cover and let sit for at least six hours. The next step with the orgeat is to strain the mixture through cheesecloth to remove the peanut solids. To the thick muddy liquid add one ounce of vodka or brandy and a teaspoon of orange flower water. My advice here would be to just add a shot of Cointreau instead and a little dab of peanut butter to amp up the flavor. Stir. Presto, orgeat. It will keep up to two weeks in the refrigerator. 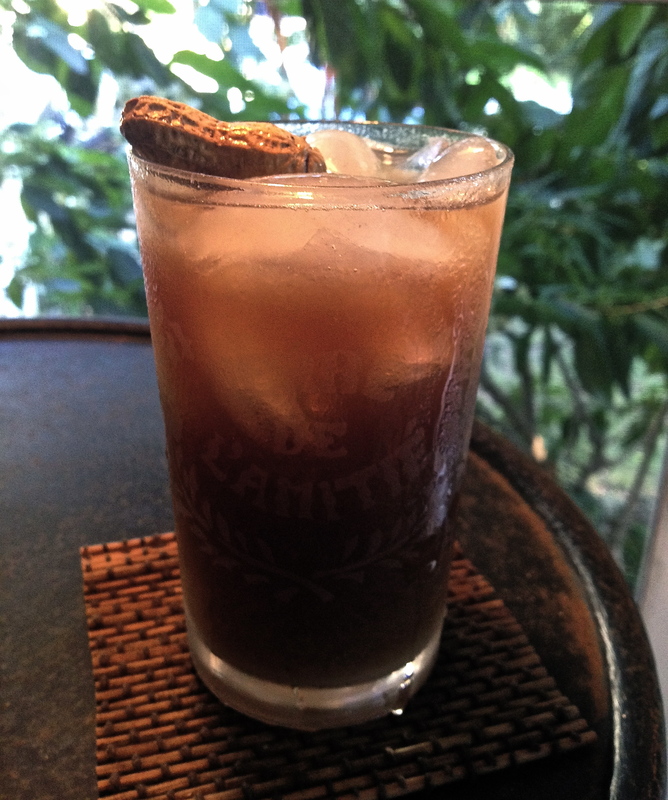 To prepare the cocktail, simply add two shots of Jack Daniels, one shot of the peanut orgeat, ice, and fill with Coca-Cola. Garnish with a roasted peanut. The folks at Ollie Irene call their concoction a “Tallulah.” My drinking companions and I called it “Type Two” because we swear we could feel our pancreases working overtime to process all the sugar. It was surprisingly tasty, though a tad pretentious for my taste and probably best suited for a brunch with mixed company. About that six-hour prep time…well, no cocktail should take that long to prepare. And that my friends is strange behavior worth hollering about. OK, you had me at “I was spreading peanut butter on my bagel the other morning in the Korean deli” but “Garden & Gun Magazine”?! I can hear your voice saying hollerin’ and high fallutin’ AND I know the look you gave those people as you added more nutter butter to your bagel. Loved it, and yes 6 hours for almost any kind of beverage is crazy.